At one stage, I painted a lot of the walls and woodwork of the Zodiac coffee bar, and also produced the menu signs that were on the wall. When I had finished, I was owed a final payment of £10; that was a massive amount that represented almost a month’s money for me. The owners claimed they were short of cash and suggested I could take the snooker table as final payment. The snooker table was a lovely thing that was 1/3rd size and was kept in a room above the coffee bar. Do you remember this guy’s name? I thought this was a great offer, and persuaded a friend of mine who had an A35 van to help me collect it. The table top which was slate under the green baize separated from the legs, so we managed to just squeeze it into the back of the van. I then realized I had nowhere to use it or to actually keep it. I had to store it in my girlfriend’s father’s garage which is where it stayed until I finally married her. I have kept this snooker table all these years and even though I have since remarried and moved to Suffolk, I still have this snooker table. At this time very few people of my age had a great deal of spare cash. But even so we managed to have enough to keep the juke box playing, and this music certainly was an important part of the Zodiac. 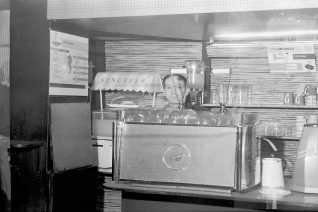 Apart from TV programs and radio stations like Luxemburg, who never played the end of records, the only way we really listened to the latest songs was in coffee bars and at dance halls or clubs. Not many people could afford to buy records and if they did, they could only be listened to at home on a stylus record player. I have a terrible memory for names and though I can recall many faces of the people in the coffee bar, I cannot in all honesty remember their names. I am certain that a number of people who frequented the Zodiac at the time will remember the place from these pictures which I am now so glad I took. We all look back at our youth with fond memories if we are lucky and I am no different. My memories of the time I spent in the Zodiac and the part it played in my life at the time are priceless. Did you visit the Zodiac? What songs do you remember from that period? Maybe you were one of the lucky ones who owned a stylus record player. If you can share your memories with us, please leave a comment below. My friends and I remember the Zodiac really well. Between 1965 and 1967 we often went there for a frothy coffee! I would often choose Stevie Wonder ‘I was made to love her’ on the juke box and my friend Yvonne would choose to play ’Respect’ by Aretha Franklin. At weekends we loved going to the Florida Rooms to dance. I saw The Who play live around 1965 or 1966 at the Florida Rooms but our parents still wanted us home by 11pm! 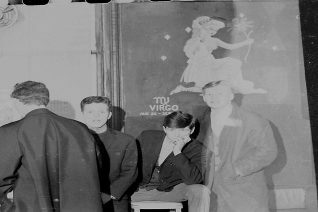 My friends and I were regular visitors to the Zodiac , from ’65 onwards. 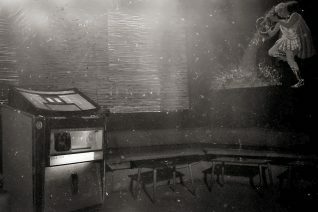 We always used to stand near the cigarette machine next to the coat racks, we never drank coffee, alway coke and lemon . Listen to a lot of Neil Sedaka hits, and remember vividly hearing” it might as well rain until September” by Carol King for the first time. Great memories. I remember the Zodiac so well. It was probably the most exciting place in Brighton, for many of us, in the 1960s, with its matt black walls and orange lighting. One cup of frothy coffee and you were set up for the evening. 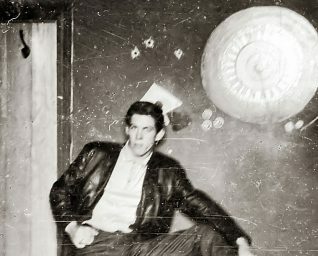 What always interests me about photos like the ones posted here is that they look so old-fashioned and the people in them seem to have come out of the dark ages. Neither the place or the people were old fashioned, of course and most of us had at least a few really modern items in our wardrobes. It is odd to find out how much photos can modify our memories. The matt black walls were clearly a contemporary statement. The Starlight rooms also had them. 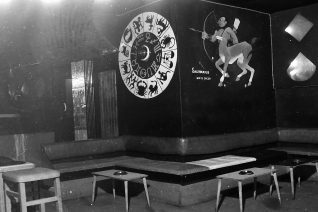 For a while, the Starlight Rooms opened on Sunday afternoons. In the light of the day, the place lost its magic, which only came back in the darkness of the evening. At one point I had considered painting my bedroom matt black, but common sense prevailed. I did, however, take one nod towards the Zodiac and had a huge, orange, lamp shade. Would any of you be happy for me to interview you on tape? 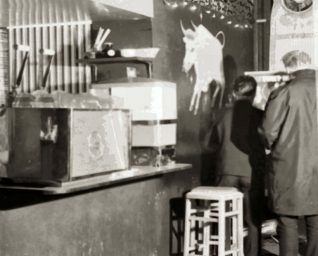 I’m putting together a podcast about coffee bar culture in Soho and Brighton, and would love to hear more of your stories!